Following the release of their debut EP All the Things I Never Said earlier this year, indie-pop newcomers Pale Waves have announced an extensive UK and Ireland tour, including dates in London, Dublin, and their hometown of Manchester. Signing to indie label Dirty Hit (home to The 1975 and Wolf Alice) in 2017, Pale Waves have established a name for themselves as purveyors of shimmering pop hooks infused with brooding melancholy. Their stylish goth aesthetic has drawn comparisons to The Cure, who they’ll support in London next month. They’ve already released six slick music videos, all neon and moody, to kindly satiate even the most impatient of fans. However latest single Kiss is a reliably catchy celebration of summery 80s synth, sure to add further demand for a full-length release. 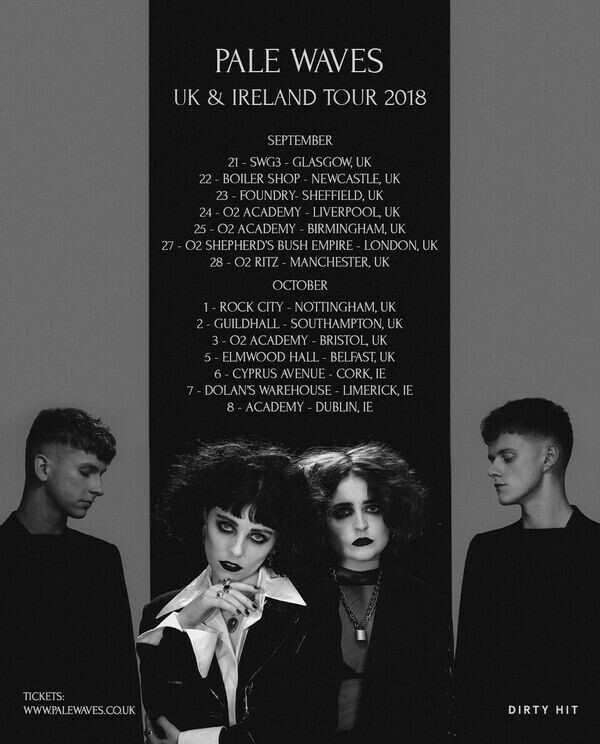 Tickets for Pale Waves upcoming tour are on sale now; catch them while you can. Dates are listed below and more information can be found at www.palewaves.co.uk.